Russia has continued facilitating Iran's expansion in Syria following President Donald Trump's new Iran strategy rollout. 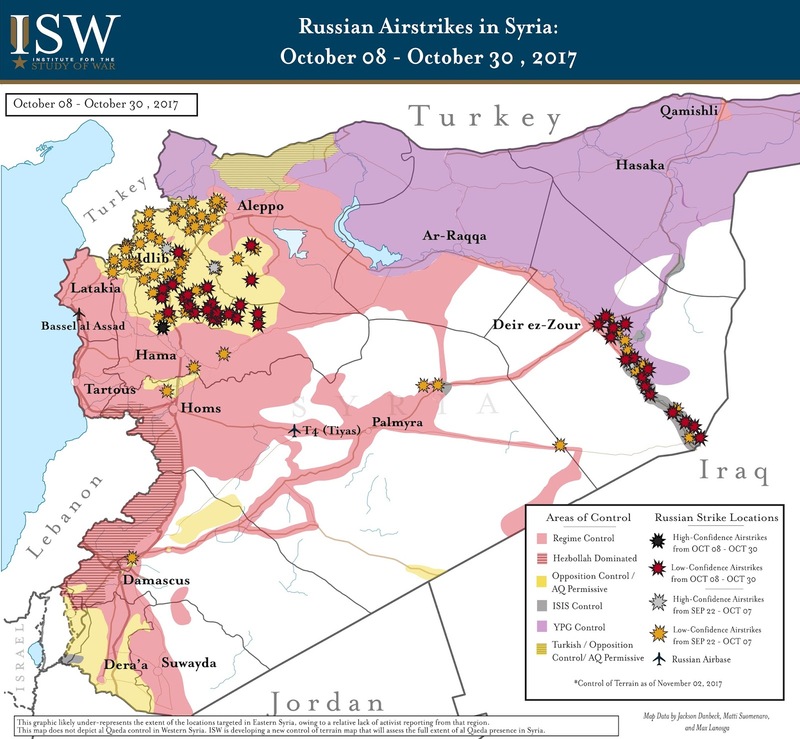 Russia sustained its air campaign in October 2017 to support ground operations led by pro-Bashar al Assad regime forces, including Iran and its proxies. Russian forces conducted this campaign across two fronts, targeting anti-regime opposition forces in Western Syria as well as ISIS in Eastern Syria. Russia continued airstrikes across opposition-held terrain in Idlib and Hama Provinces that it began after an offensive launched by Hay’at Tahrir al-Sham (HTS) – al Qaeda's affiliate in Syria – in Northern Hama Province on September 19. 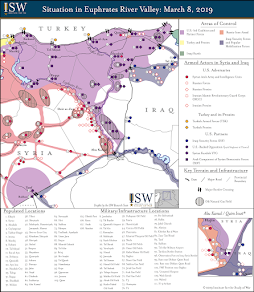 Russia also supported pro-regime forces in a major offensive along the Euphrates River Valley towards the Syrian-Iraqi Border that included the seizure of Mayadin on 14 October. Russia forward-deployed Su-25 ‘Frogfoot’ close-air-support aircraft to T4 (Tiyas) Airbase in Central Homs Province in order to support its operations in Eastern Syria. Pro-regime forces later seized multiple districts in Deir ez-Zour City with significant air support from Russia on October 25 - 30. Pro-regime forces likely intend to advance upon the key border town of Albu Kamal on the Syrian-Iraqi Border. ISIS reportedly relocated a significant portion of its leadership, media, and external attack cells to Mayadin and Albu Kamal in response to the successful offensives by the U.S. Anti-ISIS Coalition against Mosul and Ar-Raqqa City. Russia continued to masquerade as a legitimate counter-terrorism actor while prosecuting an aggressive campaign against vulnerable civilian populations in Hama, Idlib, and Deir ez-Zour Provinces. Russia simultaneously targeted both legitimate military targets and illegitimate civilian targets in order to obscure the real nature of its air campaign in Syria. Russia targeted key civilian infrastructure in regions held by ISIS in Eastern Deir ez-Zour Province including multiple civilian ferries fleeing the fighting in Mayadin on October 10 -12. Russia also expanded its air campaign beyond strikes against HTS in Idlib Province. Russia targeted a headquarters belonging to Islamist group Faylaq al-Sham – an opposition group formerly backed by the U.S. – on October 13. Russia also conducted airstrikes targeting at least two schools and three internally displaced persons’ camps in Idlib Province from October 9 – 20. 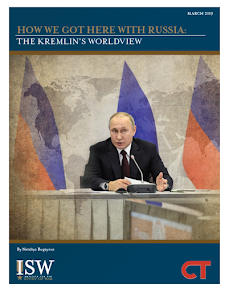 Russia will continue to publicize its strikes against Salafi-Jihadi groups such as ISIS and Al-Qaeda in order to distract from its wider punitive campaign against civilians in opposition-held regions of Western Syria.